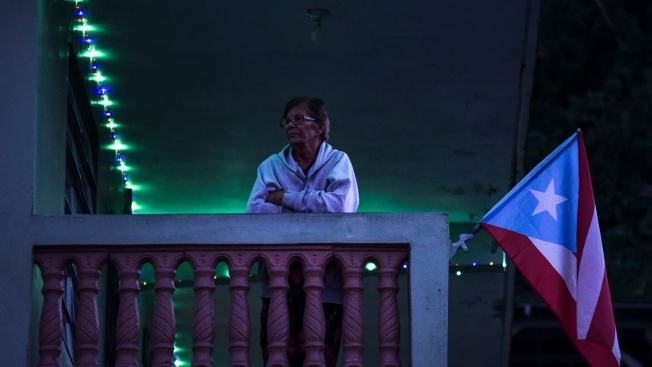 In this Dec. 21, 2017 photo, Inocencia Rivera, mother of Eduardo Gonzalez, a man who died by suicide three weeks after the passage of Hurricane Maria, receives the night in her balcony, surrounded by small, solar powered Christmas lights and a Puerto Rico flag, in Morovis, Puerto Rico. Government officials say they are counting some suicides as part of the official death toll because people across Puerto Rico have become so desperate in post-hurricane conditions. Exactly five months after Hurricane Maria, new figures show suicide rates in Puerto Rico reached a new high after years of steady drops. At least 103 people have died by suicide in the aftermath of Hurricane Maria, which ravaged Puerto Rico on Sept. 20. That’s 14 more people than in the same period the year before. Last year ended with a 29 percent increase in suicide cases reported to Puerto Rico’s Department of Health compared to the previous year. Although the island’s Department of Health has not done a comprehensive study to correlate the spike in suicide rates with Hurricane Maria, experts say that natural disasters have an impact on people’s mental health. A spike in suicidal ideation, which includes thoughts of suicide, shows a marked increase. "Previous literature shows, and this is in any part of the world, that during the first six months after a hurricane there’s an increase in mental health symptoms," said Glorisa Canino, director of the Behavioral Sciences Research Institute at the University of Puerto Rico.